Navman F20 is pre-installed with mapping for UK and Ireland with detailed maps of England, Scotland, Wales, Northern Ireland and Republic of Ireland. The Navman F20 provides 3.5-inch colour touch screen, with 2D or 3D moving maps display and includes full 8-digit UK postcode search. Directions are clear, and the Back-on-Track function means you are never lost, even if you take a wrong turn. The Navman F20 also includes speed camera locations and is pre-loaded with the latest speed camera database. Navman F20 has been discontinued. Accessories, spares and parts are still available for your F20, as are road maps. The Navman F20 satellite navigation system features antiglare 3.5-inch colour touch screen, points of interest, advanced motorway navigation and dedicated buttons to find the nearest petrol station or car park - ideal when you’re somewhere unfamiliar. The Navman F20 also features a full 8-digit UK postcode searches with 2D and 3D moving maps of the UK and Republic of Ireland, including detailed maps of England, Scotland, Wales, Northern Ireland and Southern Ireland. The Navman F20 is pre-loaded with the Navman UK speed camera database. The latest safety camera data is fully integrated with the Navman F20. Colour coded speed camera icons are displayed on the Navman F20 so you can easily recognise the type of speed camera on your route. You can also select your proximity range allowing you to decide when you should be alerted of an approaching speed camera. The Navman F20 has been designed to be Plug and Play, and as such can be transferred from vehicle to vehicle with ease by the user. The Navman F20 is powered with a 12-volt adaptor cable in-car (supplied) and attaches to your vehicles windscreen via the Navman F20 suction mounting bracket which is also included. The Navman F20 includes speed camera locations pre-loaded. Subscribe to monthly updates of speed camera locations for the United Kingdom. Subscription to the Navman UK speed camera database is priced at £24.95 for 1 year or £49.90 for 3 years. The Navman F20 works with Tele Atlas Maps to provide detailed street level maps of the UK and Republic of Ireland. Tele Atlas Maps provide high quality, detail rich maps, which in addition to street information include features such as route calculation, Points of Interest, Estimated Time of Arrival, and more. Further Navman F20 maps are available SD card which insert directly into the Navman F20. Available Navman F20 maps include, Western Europe, Eastern Europe, France, Germany, Spain, USA, Canada, Australia and New Zealand. 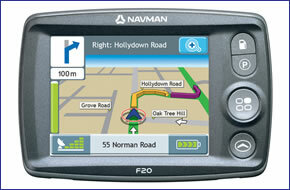 View the complete range of maps available for the Navman F20. Although the Navman F20 has been discontinued, a number of accessories are still available to buy from ActiveGPS. These accessories and spares include: windscreen suction cup mount, T1 traffic module and B2+ Handsfree and traffic module. Maps for the Navman F20 are still available. Although no new map has been issued since 2008, we do still have a very limited stock of North America maps in stock. e it, can you help? Answer: Unfortunately as the map has been discontinued you will be unable to update the maps on your Navman F20 with any other map. Do you have a question about the Navman F20? Submit your question via our contact page.